Inspired by The Hobbit™ and The Lord of the Rings™ trilogy, the immortal work of J.R.R. 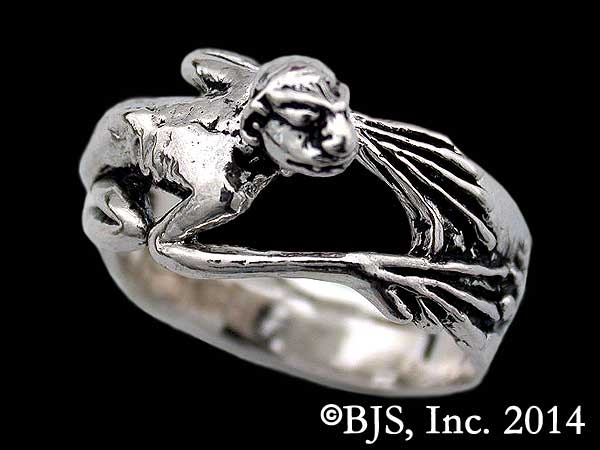 Tolkien, comes The Gollum™ Creature Ring. Gollum™ the pitiable creature Sméagol™ who was enslaved by his need for the Precious™. Each ring is carefully handcrafted one at a time by the Badali Jewelry artists in your choice of sterling silver, 14k white gold, 14k palladium white gold (nickel free white gold), 14k yellow gold and 14k rose gold. Palladium white gold and rose gold are custom options and make your item non-returnable or refundable. 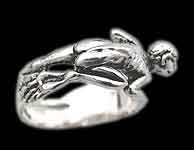 The Gollum™ Creature Ring is officially licensed The Hobbit and The Lord of the Rings jewelry with Middle-earth Enterprises. Gollum’s™ spindly arms and legs wrap around your finger, creating the band. The ring is available in US sizes 6 to 20, in whole and half sizes. Sizes 13 1/2 (13.5) and larger are an additional $15.00 US in sterling silver, additional $45.00 in 14k gold. The ring measures approximately 12.3 mm (1/2″) wide at the Gollum’s elbows and the band measures approximately 5.6 mm (just under 1/4″) wide. Sméagol’s™ head rises approximately 8.2 mm (5/16″) from your finger. The ring weighs approximately 7.1 grams in sterling silver, approximately 8.8 grams in 14k gold. Weight will vary with size.